HHTM Staff: Hansen’s disease, (leprosy) is one of the “neglected” infectious diseases under review in this series. Hansen’s is caused by a parasitic bacteria which makes a comfortable home in human bodies, sometimes for decades before manifesting as a variety of symptoms that depend on the person’s autoimmune response. The bacteria is likely the oldest human parasite on earth, having “jumped” to humans and assumed a parasite lifestyle 20 million years ago. Modern science is closing in on two important questions: How do we get the disease? What is the mechanism of destruction in our bodies? Modern medicine has a cure, even though the scientific questions are still up in the air. What modern medicine lacks is methods of prevention or early identification to allow treatment to commence prior to irreversible nerve damage. Today’s post looks at historic and current means of identification and differential diagnosis. Leprosy was identified by symptoms and signs in Biblical times. An omen tablet from the Old Babylonian period describes a leprosy-like disease with symptoms of loss of skin pigment, odor, and an apparent outbreak of papules (Kinnear Wilson, 1966). In Leviticus, lepers were designed “ceremonially unclean.” Hebrew priest-physicians made the differential diagnosis from inspection over a 14 day quarantine of people with suspicious skin symptoms. The diagnosis was leprosy if skin lesions persisted and “the local hair had turned white … and the affliction seemed to have penetrated the skin” (Harrison, 1986). In the Middle Ages, Christian rhetoric equated sin with uncleanliness and lepers. As a result, identification stigmatized leprous conditions even more than other disease states in those times. The “walking dead” were issued begging bowls, distinctive clothing and clappers to announce their diseased status (Edwards et al., undated). Identification by association with living condition “signs” (e.g., filth, degradation, poverty, putrefication) evolved and persisted for centuries. For example, “léperos” or pelados (tr: the peeled) were synonymous colloquial expressions in 19th century Mexico City for the diseased, unclean, urban poor (Johns, 2011). In sum, “diagnosis” was a loose term for labeling disfigurements, skin eruptions, neuropathies, and various infections as leprosy, especially among the poor and unwashed. Post 3 in this series described the roll-out of signs and symptoms: Numbness is almost always the first sign, followed (sometimes years later) by visible, scaly skin nodules called “lepra” which often manifest on extremities (e.g., digits, nose and ears). 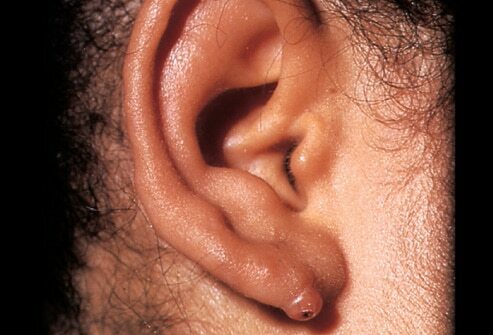 Outer ears thicken with smooth, shiny lesions. Chronic infections often accompany lepra, especially affecting the skin, eyes and mucous membranes. Underlying the lepra, destruction of sensory nerves is in progress, leading to the next stage of the disease in which sensation is lost successively to temperature, touch, pain and deep pressure. Fingers, toes and other extremities are shorted or damaged/destroyed as peripheral neuropathy progresses. Noto and Schreuder (2010) give the following list of symptoms or signs, noting that presence of any one of them is grounds for suspecting leprosy. painless wounds or burns on the hands or feet. Han et al. (2008) notes that individuals’ autoimmune systems cause “the clinical features of the disease and its severity vary greatly, both geographically and from person to person.” In addition, newly discovered species of the bacilli may explain some geographic variation. Bolognia, et al. (2012) provide an extensive discussion of identification of the disease in various forms and guises. Cuts are made in the ear lobe(s) and lesions to collect tissue and smear it on slides. The slides are then stained for the bacili. Multiple slides are examined under the microscope in search of “globi:” globular masses containing the bacili. A quick read through the complicated field instructions tells you why this test is not definitive or used as a screening tool. The following video demonstrates the complex and time consuming procedure, notwithstanding the additional time, equipment and expertise needed to read multiple slides. Do Audiologists Have a Role? It is no surprise that Audiologists, along with other healthcare workers, know little if anything about identifying this disease. While the skin smear test is not going to become part of the Audiology training curriculum, awareness of signs and symptoms is a reasonable goal. Audiologists routinely perform otoscopic examinations of ear canals and pinna. Likewise, they assess patient’s finger sensitivity when considering hearing aid recommendations. Both procedures lend themselves to Noto and Scheuder’s list and observed anomalies should be reported to the patient’s physician. Bolognia JL, et al. Leprosy (Ch 24). Dermatology (3rd ed). Elsevier, 2012. Edwards J, et al. Lepers. Marginality and Community in Medieval Europe. Kenyon College (undated). Harrison, RK. Background on leprosy in the Bible. International Standard Bible Encyclopedia. Grand Rapids: Eerdmans. 1986. Johns, M. The City of Mexico in the Age of Diaz. Austin: Univ of Texas, 2011. Han et al. “New Leprosy Bacterium: Scientists Use Genetic Fingerprint To Nail ‘Killing Organism'”. ScienceDaily. Nov 28 2008. Kinnear Wilson, JV. Revue d’assyriologie et d’archeologie orientale. Archaeology, 60 (1966) p 47. Noto, S. & Schreuder P.A.M. Diagnosis of Leprosy . LML Distance Learning Guide. Int’l Fed Anti-Leprosy Assns (ILEP). April 2010.